Kampot, 캄보디아의 쿨 캄폿 | 호스텔월드에서 예약하세요. 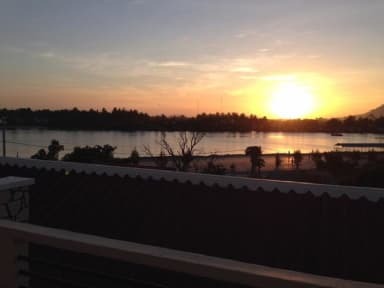 Kool Kampot is located along the private banks of Kampot River, providing comfortable and affordable accommodation with free Wi-Fi throughout the hotel. The property is a short walk along the river to the main restaurants and bars. Our six-bed mixed dorm is air-conditioned from 7pm – 7am. The dorm includes lockers, bed linen, bath towels and complimentary toiletries and free in-dorm water refills. The en-suite bathroom is fitted with hot and cold shower facilities. Free Wi-Fi is available in the dorm. Our private basic double room with share bathroom comes with ceiling fan (no air-conditioning). Our private superior and standard rooms are all fitted with both air-conditioning and ceiling fans. All rooms include bed linen, bath towels, complimentary toiletries, minibar/fridge, closet, desk/chair, in-room safe, complimentary in-room instant coffee/tea and bottled water. En-suite bathrooms are fitted with hot and cold shower facilities. Free Wi-Fi is available in all rooms. The property houses a rooftop area where guests can enjoy their choice of drinks while watching the sunset over the river and mountains. Guests can play pool/billiards, or seek assistance with tour and travel arrangements, motorbike hire and luggage storage. Free parking is available on-site and airport transfers are available at a fee. 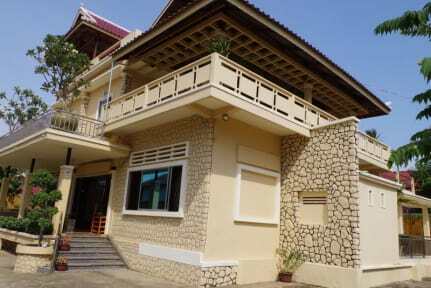 The relaxed and peaceful atmosphere combined with our friendly and helpful staff makes Kool Kampot the ideal place to stay while exploring the town and its surroundings. •All guests must be 12 years of age or over. •We accept cash only (US Dollar and Cambodian Riel). •Check in is from 2pm, although you are welcome to check in earlier if your room is available. •Check out is before 12pm, although we will accommodate late check-out if possible. •Room rates are charged on a per room per night basis and exclude meals. •Supplements are not calculated automatically in the total costs and will have to be paid for separately during your stay. •All rooms are non smoking; however smoking is permitted on the outside terraces. •Any damage caused to the room or contents will be charged accordingly. •Rooms are different in size (m2). •No deposit will be charged. •If cancelled or modified more than 3 days before the date of arrival, no penalty will be charged. •If cancelled or modified fewer than 3 days before the date of arrival, the first night will be charged. •In case of no-show, the full booking amount will be charged.